Size - 41" x 48"
A new presentation of one of our bestselling patterns. This quilt has done so well all over the country and at the request of quilt shops; we have taken it from a packaged pattern to a full color book. 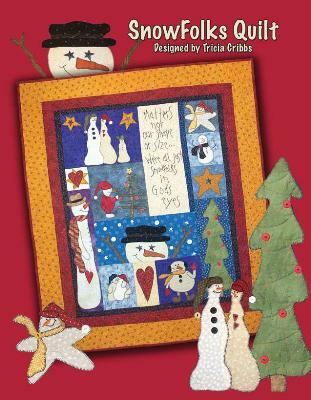 We designed this pattern to celebrate winter and SnowFolks. 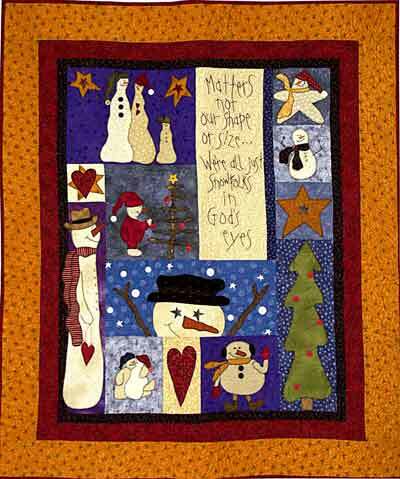 The stitchery is "Matters not our shape or size, we’re all just SnowFolks in God’s eyes". Another simple to piece, simple embroidery, and easy machine appliqué quilt. Buttons make it really come to life. All these cute appliqués work great for T-shirts, aprons, dish towels, etc.